It's a big anniversary year for the National Aboriginal & Torres Strait Islander Art Awards - aka The Telstras. As Luke Scholes, the newish Curator of Aboriginal Art & Material Culture points out, 2016 celebrates 40 years of Aboriginal Land Rights and the year that ended the interminable Kenbi Land Claim happily for the Larrakia in Darwin; it's 50 years since the Wave Hill walk-off; it's a mighty 33 years of the NATSIAAs, and they're celebrating 25 years of Telstra sponsorship with a few little extras. 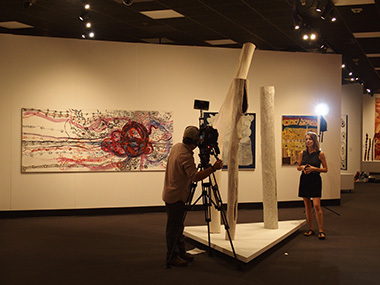 For instance, previous winning artists have seen their work taken to the cold southern cities to alert them to the warm joys up here; Scholes has been appointed as a much-needed Indigenous curator for a museum that's clearly at the heart of the whole movement and will be doing important things next year like showing off their amazing early Papunya boards in exhibition; and the ceremonial aspects of the presentation of awards later tonight has been pepped up - as they should be. So, how has all this fed into the 2016 Awards? 224 entrants hoped to be here, their number whittled down to a limit of 75 by judges Vernon Ah Kee (Brisbane-based artist), Kimberley Moulton (Melbourne-based museum curator) and Don Whyte (described as “The Impresario of Darwin”, an artist and framer who's been professionally associated with the Awards since 1993). And the selection - which contains the $50,000 Big Telstra winner, five category winners and no Highly Commended, “because the whole room's Commended” says Whyte – reflects the artists' hungry desire to be here in greater diversity than ever, I suspect. It's not just that urban artists seem to have re-discovered their enthusiasm for the steamy North; I believe that many artists are pursuing novel ways of telling mythic stories, and, in the Salon des Refuses, which picks up the cream of the crop that didn't make it into the Museum, there are more new names emerging confidently to suggest absolutely no end to Aboriginal art. Heading my list of innovators, therefore, is Yaritji Young from Amata in the amazingly abundant APY Lands, whose work might be mistaken by casual viewers for something by John Olsen. It's a complex Honey Ant Dreaming story, telling of their lifestyle and value as a food source. But how extraordinary that such disparate artists with such a different outlooks on the world should see our landscape so similarly – it must be how it really looks! I think I might have made it a Winner. Others in the traditional/innovator category would be The Tjanpi Weavers, creating a sickness and health story from their desert grasses; Pepai Jangala Carroll putting a water-snake legend on to a 75 cm ceramic pot; the venerable Ngarritja Tommy May etching his Kurtal rainbow serpent and thunderous rain onto tin; Wukun Wanambi using unvarnished larrikitj trunks - all lumps and holes – to represent sacred rocks; Mumu Mike Williams staining a map of Australia with team and Pitjanjatjara words to claim “This land belongs to all of the tjilpis and pampas (old men and women)”; and Andrew Snelgar – surely the first Ngemba/NSW-identifying artist in the Telstras – with a sibling rivalry legend painted on to three shields. But the actual Big Telstra winner was Harold Thomas – a name to conjure with as the designer of the politically-potent Black, Red and Yellow Aboriginal flag, but less well known (to his regret) as a consistent painter. His work is extraordinary – as is perhaps too often the case with the Big Telstra winner. Think back to the Tjanpi Toyota, Dennis Nona's mighty croc, Richard Bell's 'Theorem', Danie Mellor's great Masonic painting, and perhaps the last significant works by elderly artists such as Makinti and Mrs Snell. I guess it's easy for a group of judges to agree on such stand-out works – though they may not actually be the best art on offer. 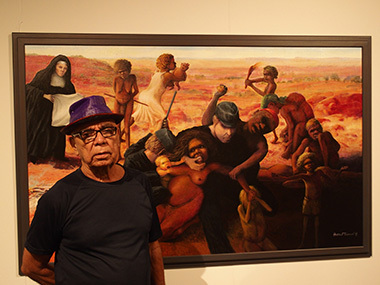 Harold Thomas's quasi-Renaissance work – which he agrees harps back to artists such as Caravaggio and Gericault, whom he encountered as the first Western-trained Aboriginal artist back in the 1960s – tackles the abduction of Aboriginal children with the violence of a 'Massacre of the Infants' in the sort of desert landscape for which he's better known - that and Kakadu lilies that Monet might be proud of. “We were rewarding the evocation of feelings Harold achieves in this painting”, explains Don Whyte; and few could deny the pain of the mother having her babe snatched literally from her breast, the unfeeling faces of the police 'just doing their job', and the naked aggression on the advancing nun's face, desperate to cover the nakedness of the baby. As the stolen child of two stolen parents, there are generations of bitterness available to Thomas. Something of the same generational politics may be seen in the selection of the Best Bark Award for the great John Mawundjul. It's not the best Mawurndjul ever painted - but boy it's good to see him back painting after the dreadful hiatus in Maningrida art. As he and his Kuninjku cohort put it, “the global art market collapse combined with the Intervention, run by people who thought they knew everything, disempowered us and disrespected the artists and put us on the ground”. I'm delighted by this third Best Bark recognition for Mawurndjul, but have twinges of regret that the dominant Buku Larrnggay art centre's Garawan Wanambi was left right out of the NATSIAAs for his dark and powerful work, 'Marranngu' which I felt stood out in the category. Mysteriously, the Best Painting Award went for the second year running to Betty Pumani from Mimili in the APY Lands – which many, viewing the plethora of mighty canvases from that area in the Salon which opened on Wednesday night, feared might have been rejected wholesale by the judges. Not true – APY is as strong as ever, the women filling vibrant canvases and the men inspired by the great Tarnanthi Spear project. But one wonders whether the judges saw Pumani's work last year – differing only in a courageous extension to the width of her Maku/Witchetty Grub evocation. Best Work on Paper was a new name to me – Robert Pau, from Erub Island in the Torres Strait via Cairns. And his imagery is new too – reporting on Black wars I'd not heard of involving the notorious Blackbirders seeking slaves for the cane-fields and polluting vital water-holes to the point that the Islanders chose to fight back. Mythic guidance from above and sharks prowling below frame the actively researched Battle of Bikar. A name and a historian to watch. 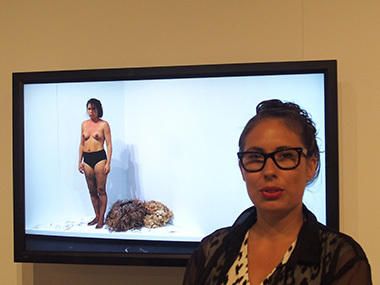 Nicole Monks also broke new ground with her 3-D prize-winner – the first performance artist to get a Telstra. Sydney-based, she used a residency at Fowler's Gap, out from Broken Hill, to explore her sense of being “trapped between two worlds”. Or possible three as she identifies with Walmajarri, Dutch and English ancestries, but used the wool from imported sheep and the feathers from native emu to clothe her nakedness two-way, then cast the spirit-crushing wool aside to reveal her bare-breasted all. Finally, a second film took out the youth award for Ishmael Marika from that mighty Yirrkala family. Called 'Sunlight Energy II', he examined sunrise and sunset over the sands and sea of his local Arnhemland, blended light and smoke from burning off through an Arnhem treescape, then caught the tumbling dust in the motes and beams of sunlight in a Lake Mungo wool shed to sense the energy of that mythic place. The NATSIAA hang by Luke Scholes felt good, using sculptural works cleverly to balance the density of canvases and works-on-paper on the walls – though I clearly made connections that he didn't between Mamu Mike Williams's spear-framed work and the more youthful Anwar Young's hanging army of 'Kulata' (Spears); and between Nicole Monks's natural/unnatural clothing, Nici Cumpston's photo of grass-trees as bunyip figures and Georgia Macguire's paper-bark figure, 'Ill-fitted uniform II', imposing unnatural clothing on the Woiwurrung of Western Victoria. As perhaps can be read from the sheer number of artists deserving a mention this year, I have emerged with strongly positive feelings about the selections for the 2016 Telstra/NATSIAAs, but a few questions about the judge's choice of some of the winners. But remember Don Whyte's words – all were Highly Commended.